With the data glasses, Head Mounted Display (HMD), you can immerse yourself in virtual realities. 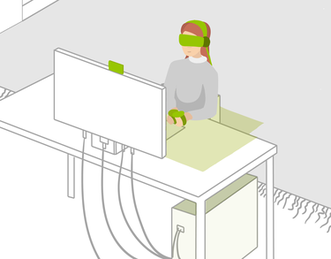 From the simple cardboard, a smartphone carton holder and the Samsung Gear VR (for immersion in 360-degree 3D worlds in photo and film), to the Oculus Rift and PlayStation VR (with built-in displays for a deeper experience of virtual worlds), to the HTC Vive (through which active experience and movement in the room as well as interaction with virtual objects is possible), there are various data glasses available for you to choose from. On our YouTube channel, you will find playlists of selected VR content that we have compiled for you. With Mobile VR, the VR system does not have its own integrated display. This is done by connecting a smartphone to the glasses via a USB stick. Mobile VR can be controlled with controllers and/or touch functions. Although the head movement and orientation is calculated by the smartphone, the system cannot record the user's changes in position. The VR system consists exclusively of glasses (with controllers) - there is no need for a PC to communicate with the glasses. The smartphone performs this function. Because smartphones do not deliver the same performance as PCs, mobile VR experiences are in many ways inferior to those of the Seated VR and Room Scale VR. The Cardboard is the cheapest solution for an approximation for a first impression of the mobile VR experience, which can make mature VR glasses possible. The cardboard consists of a cardboard holder with two built-in Biconvex lenses into which a smartphone is inserted. After launching a VR-compatible 3D app on the smartphone, the smartphone sensors detect the user's head movements. He can look around freely in virtual 360-degree environments and, with the help of headphones, he can also hear noises behind him. The Samsung Gear VR headset and Google Daydream are also representatives for sophisticated mobile VR glasses. They are loaded with a compatible smartphone that acts as display and processor. The headset contains special lenses and is equipped with sensors for better motion tracking and reduced latency. This enables the user to better perceive the virtual 360-degree environment. The Gear VR also includes a touchpad that allows the user to interact with the virtual environment. The corresponding function is selected with the eyes and activated with the finger on the touchpad. Additional gamepads can be connected via Bluetooth for control within the VR worlds. The Samsung Gear VR was developed in cooperation with Oculus VR. The latest systems for Mobile VR are self-contained VR HMDs like the Oculus Go, which require neither a PC nor a smartphone. For the configuration of the Oculus Go a smartphone is needed at the beginning, after that the HMD also work without tools. The setup includes a handy controller with which the system is controlled and simple interaction is made possible. For 2019, Oculus has announced another self-contained VR HMD that will offer significantly more freedom and interaction than the Oculus Go, the Oculus Quest. With the VIVE Focus, HTC also has a self-sufficient VR HMD in its range, which is currently only available for developers and business customers. With Seated VR, the sensors of the glasses and the controller receive the signals from the IR LEDs. A small area is detected with laser beams. Although the position and orientation of the devices are recorded in this way, it is not possible for the user to move outside this small area, as otherwise the signals of the LEDs can no longer be received. If you want to use Seated VR, you need a powerful PC (or console) in addition to the VR system. Seated VR glasses are represented by the Oculus Rift and the PlayStation VR data glasses. Each one fills the user's field of view almost completely with its large built-in display. Image edges are barely perceptible. The user is surrounded by 360 degrees of a virtual world, so that he seems to be "in the centre of this world", in the game (immersion). Sensors in the head-mounted display and outside, register every head movement – giving the user the impression that he/she can look around in a natural way. The sensors function much faster than previous sensors in head-mounted displays or smartphones. This significantly reduces latency, the delay time between head movement and image display. The impression of being "in the action" increases. The illusion of the virtual world seems to become real when looking through these glasses: If we virtually collapse from great heights, a real "queasy" feeling is experienced in the stomach. Representatives for Seated VR are the Oculus Rift and the PlayStation VR HMDs. Each of them fills the user's field of vision almost completely with its built-in large display. The edges of the images are barely perceptible. The user is 360 degrees surrounded by a virtual world, so that he seems to be "in the middle of this world", "in the game" (immersion). Sensors in the head-mounted display and outside register every movement of the head - giving the user the impression that he can look around in his usual, natural way. The sensors function much faster than previous sensors in head-mounted displays or smartphones. This significantly reduces latency, the delay time between head movement and image display. The impression of being "in the action" increases. The illusion of the virtual world seems to become real when looking through these glasses: If we fall virtually from a great height, a real "queasy" feeling appears in the stomach area. Room Scale VR is similar to the Seated VR principle. Base stations consisting of IR LEDs and two lasers each (y-axis and x-axis) emit laser beams that are received by the sensors of the controllers and the VR glasses. In this way, the exact position and orientation of these devices can be determined. The user is thus offered a relatively large space in which to move. For the optimal Room Scale VR experience, a high-performance PC is required in addition to the mentioned devices, which calculates the movements and transports the user into the virtual environment. The HTC Vive can be used for the Room Scale VR experience. It includes a headset, two wireless controllers and two base stations for 360-degree room tracking. This enables the HTC Vive to offer the deepest VR experience of the eyeglasses presented here. 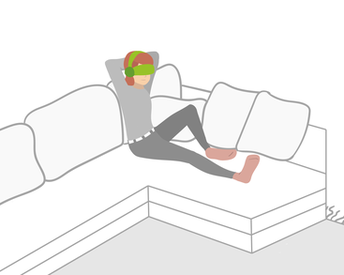 The user moves through the room using his entire body. The base stations determine the position of the user in a space of maximum 25 square meters (five by five meters). 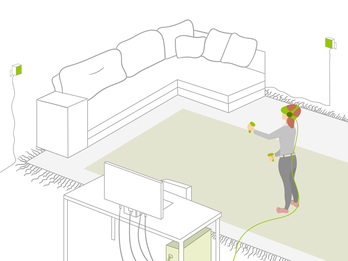 By means of special game controllers, it is even possible to interact with virtual objects. Imagine repairing a robot in a workshop – standing on the bridge of a star cruiser crossing the galaxy – exploring the alleys of ancient Rome – or shrinking to subatomic size to see molecules collide. Try it out!